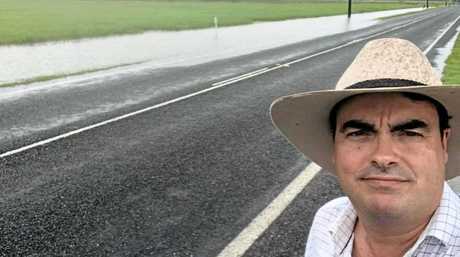 AS MORE than 100mm from Tropical Cyclone Iris once again saw both lanes of Shute Harbour Rd at Hamilton Plains underwater, a local MP is saying "enough is enough” and calling for a permanent flood-proofing fix. 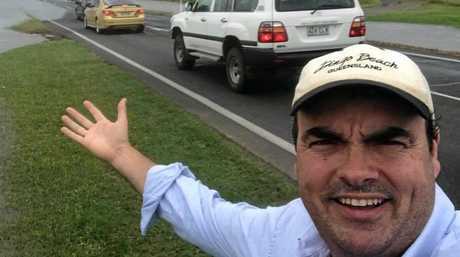 The notorious section of road has been a home away from home for Member for Whitsunday Jason Costigan, who has been solidly campaigning for a flood fix and demanding to see the "business case” promised by the Labor candidate for Whitsunday Brownyn Taha. In answer to a question on notice, asked by Mr Costigan of the Minister for Transport and Main Roads tabled by the State Government on February 15, Minister Mark Bailey said a business case "has been developed” and a "preferred project option for an upgrade” for the road had been identified. Costo in March this year calling for action on Hamilton Plains. "But where is it?” Mr Costigan asked yesterday as cars travelled through the floodwater. 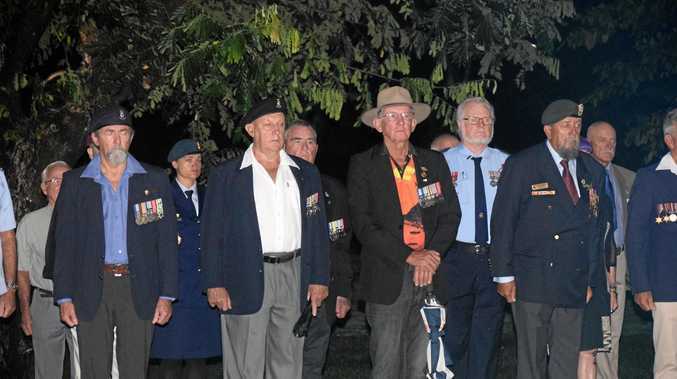 "Quite clearly Hamilton Plains is not a priority for the Palaszczuk Labor Government. Mr Bailey said details for the business case had not been released as they were commercial in confidence. "The details of business cases are used during any commercial tender, so aren't generally released before that process,” he said. In the lead-up to the State Government election last year the LNP promised $37million to flood-proof the road. Whitsunday councillors Jan Clifford, Ron Petterson and deputy mayor John Collins were present for the road-side announcement by then leader of LNP Tim Nicholls and were in support of the multi-million dollar pledge. Mr Costigan wants to see an end to ongoing disruption for visitors arriving in Airlie Beach from the Whitsunday Coast Airport and school students arriving in Proserpine from Airlie Beach and Cannonvale. 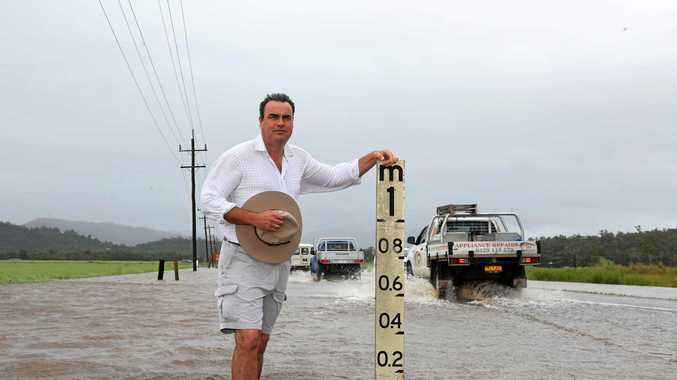 Whitsunday MP Jason Costigan has long called for a fix to flood-proof Hamilton Plains. "People don't want to get stuck, tourist operators don't want their guests getting stuck, parents don't want their kids getting stuck, husbands don't want their pregnant wives being stuck,” he said. An inability of Airlie Beach and Cannonvale residents to access the Proserpine Hospital in case of an emergency was also raised by Mr Costigan. From the side of the Shute Harbour Rd yesterday, the member for Whitsunday accused the Palaszczuk Labor Government of abandoning the people of the Whitsunday electorate. "The Minister for Main Roads, I reckon has said to himself 'stuff the people of the Whitsundays, they won't vote for us, they won't vote Labor so they can go without',” Mr Costigan said. Mr Bailey responded by stating, "Mr Costigan did nothing for roads in his electorate when in power, with his party stripping $600million from the transport budget, and slashing RoadTek jobs”. On the plains again, this time in October last year crusading for a fix. 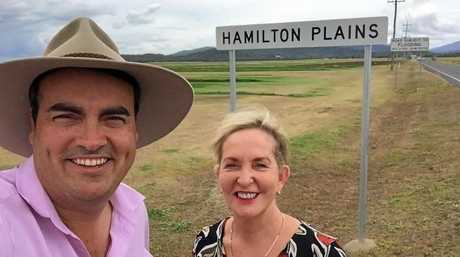 The Labor member for Mackay and Assistant Minister for State Development, Julieanne Gilbert who drove through water covering Shute Harbour Rd two weeks ago on the way to an engagement in the Whitsundays said Mr Costigan's statement was a "ridiculous”. "If we were doing that you wouldn't see the millions of dollars going into the Whitsunday Coast Airport...as well as all the other projects going on in his electorate,” she said. Earlier this month Mr Costigan was on the plains again calling for a flood fix. 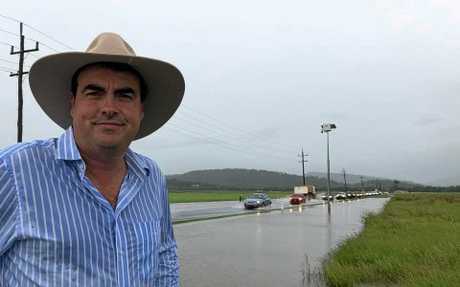 Water lapping at the edge of the Bruce Hwy at Goorganga Plains for the last several days also prompted a call to action by the member for Whitsunday. "Each level of government has its own responsibility...the Federal Government has been pathetic in relation to Goorganga Plains,” he said. "It's not rocket science what needs to be done,” Mr Costigan said.